Creating and selecting a trademark is not an easy process. There are some horror stories of businesses that have gone through some legal battles or faced trademark dilemmas in China. You certainly don’t want to waste your time in courts. To have a strong trademark, it must be distinctive enough to have full protection from trademark squatters and trademark infringements. It is all about “distinctiveness”. Your mark must be distinctive enough to be protectable and registrable with trademark offices in Taiwan and around the world. Being distinctive means less confusion for your customers. Also, a distinctive mark is easier to register and to protect from infringement than a descriptive trademark. This is the strongest kind of trademark. It is a made-up term, an invention that has no dictionary meaning at all. Because it doesn’t have any meaning, it has no connection with the characteristics of the related product. You can create the meaning and value of this word. A coined trademark may be more difficult for consumers to remember at first so it requires more efforts in advertising the products but it also means that you have a great opportunity to create a positive association between the mark and your company or product. One common way to come up with a coined trademark is to spell a common word in a new way. For example, the word “enspyre” is an old alternative spelling for the word “inspire”. Or just combine letters to create a new, completely unique word. Some well-known examples: KODAK, Häagen-Dazs, Spotify. Learn more about Coined Trademarks here. An arbitrary trademark is real word that you find in the dictionary. The meaning of the word has NO relation to the product itself or to any of its qualities that is why it is considered distinctive. A famous example is the word “APPLE”; you can not register the word APPLE as your trademark when opening a fruit shop but using it as a brand name to sell mobile phones and computers makes it an arbitrary choice and therefore distinctive. Just pick a word that you like the sound of or that makes for a nice image logo. Some well-known examples: AMAZON, Blackberry, and SHELL. Learn more about Arbitrary Trademarks here. The meaning of the suggestive trademark is as the name says a suggestion of the quality or nature of your product or service, but isn’t a straightforward description. The word requires the consumer to use their imagination and perception to understand what the product is. A suggestive trademark us also registrable but compared with the previous two types, a suggestive trademark will meet more difficulty during the government review process. Some well-known examples: baby dry, Microsoft. Learn more about Suggestive Trademarks here. Examples of What NOT to Register! There are also some good guidelines for words that the government will likely not allow you to register. If your words fit any of these categories, discard it and choose a new word! A descriptive terms is a straightforward description of the product or the nature of the products on which the mark is used. Because descriptive terms only describes your product and does not clearly identify the source of a product, consumers would not see this word as a trademark. “Apple” and “Blackberry” would be descriptive terms if you sell fruit and berries. Also, the government would consider the right of other people and companies in the same industry to be able to use this word. Since the word fails the basic function of a trademark they cannot be registered as a trademark. The distinction between a descriptive term and a suggestive trademark is the amount of imagination it would take an average consumer to understand the link between the word and the product. This is not an easy distinction to make. If you have questions, let us at Musa help you. A generic term can’t be registered or protected. 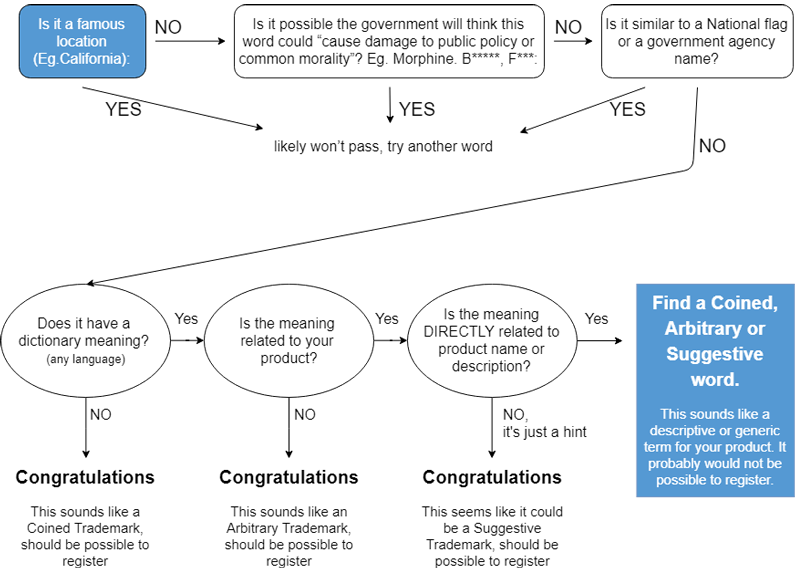 These are terms that are commonly used in general business to indicate the goods or services themselves so they can’t function as an indicator of origin. Use the flowchart below to test your words. Spend a bit more time and effort in the beginning of your branding and trademarking process. It will cost you MUCH more money, time and lost opportunities if you get things wrong and can’t register your word or end up fighting someone in court. Professional help will help you to avoid such costly mistakes. Need some help in selecting a trademark? Fill in the form below and we’ll reach out to you as soon as possible!